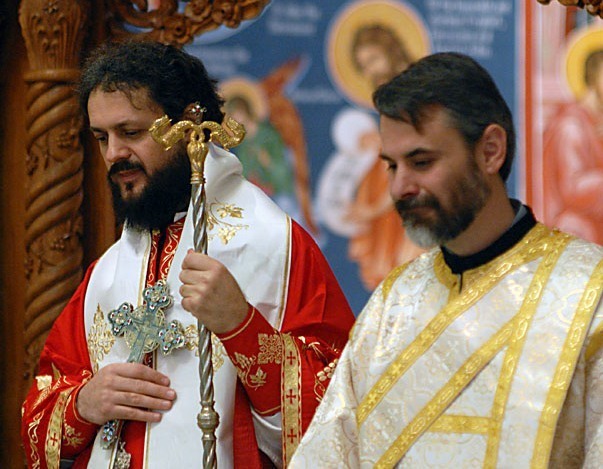 Fresno, CA - On January 19, His Grace, Bishop Maxim, celebrated the Feast of Theophany at St. Peter the Apostle Church in Fresno, CA with a Divine Liturgy that everyone in attendance will long remember. Father George Gligich, the parish priest and Hieromonk Jovan Babic, the diocesan chancellor and priest at Christ the Savior Church in Arcadia, CA along with nearly a dozen enthusiastic altar boys, met the Bishop at the front doors and filled the narthex. His Grace moved from the crisp, sunny morning into a brightly lit church with the voices of a full choir filling the air. After the Bishop’s vesting with all proper ceremony, Reader John Davis was brought forward to be ordained subdeacon as a step towards ordination to the diaconate. At the appointed time following the consecration of the Holy Gifts, Subdeacon John was led by Father Jovan from the center of the church, to prostrate before the icon of Christ, the people, and the Bishop. The choir and clergy joyfully sang as the subdeacon was led three times around the altar in the “Dance of Isaiah”. Bishop Maxim then laid hands upon him and ordained Deacon John, our diocese’s newest deacon. Clergy and the people exclaimed “Axios!” and the new deacon fanned the precious and holy body and blood of our Lord Jesus Christ. The Liturgy continued with many in attendance receiving the Holy Eucharist. At the end of the Divine Liturgy, Bishop Maxim lead the clergy and altar boys to a table prepared in the center of the church for the Great Blessing of Water. All were deeply moved in the remembrance of our Lord’s Baptism by St. John and the revelation of the Trinity. Parishioners were invited to take holy water home to sanctify their homes. Before the conclusion of the services, Bishop Maxim addressed the people by letting them know that all were thrice blessed by the morning: Our celebration of the Divine Liturgy, an ordination to the diaconate, and the feast of Theophany all happening in the same day. His Grace committed Deacon John to the service of the church and parish, assuring all that the new deacon would do well to walk always in humility. Deacon John and his wife Daria have four children, Elizabeth, Rebecca, John and Joanna. Afterwards, a banquet took place in the church hall where the parish Serbian Mothers’ Club prepared a delicious meal of traditional Serbian foods. Laughter and joy filled the hall as His Grace alternated time between enjoyable conversations with adults and happy playing with the children who sought his attention. Father George concluded the events by thanking God for His great abundance and thanking our Bishop for his presence and blessings in a day that all would remember for many, many years.